The oldest university in what would become the United States, Harvard has a world-renowned reputation today. 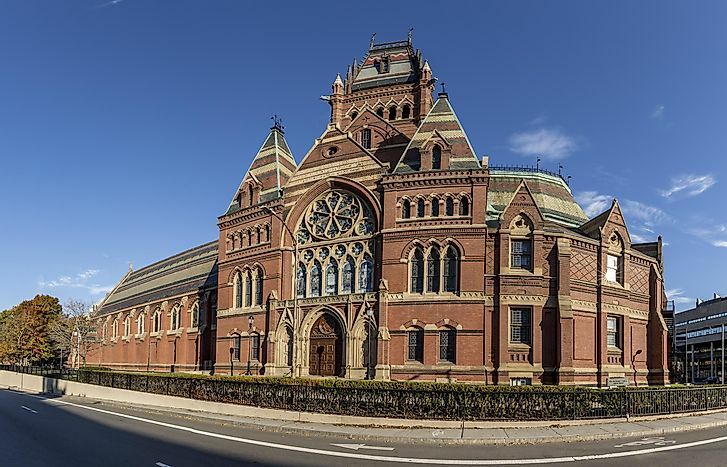 Today, several of Harvard's buildings, such as Memorial, Sever, and University Halls, are listed on the National Register of Historic Places. Harvard University was founded in 1636 after the Great General Court of the Massachusetts Bay colony's vote. Located in an urban setting in Cambridge, Massachusetts, it was the first higher education institution in the British North American colonies, and is the oldest university in the US. Initially called the "New College", it was renamed Harvard College after clergyman John Harvard, who was its first benefactor. The university gained its charter in 1650. At first it had a strong Puritan character, closely affiliated with Congregational and Unitarian churches. In its early years, Harvard trained many Puritan ministers and was usually headed by clergymen. Then, with the rise of Enlightenment in the 18th Century, the movement's values, such as reason and free will, became widespread in the colony, and the university became an important tool in the transmission of such ideas. The university underwent a process of secularization during that period, especially following Charles Eliot's becoming the school's President in 1869. Eliot eliminated Christianity-oriented teaching from the curriculum, while opening up the curriculum to increased self-direction by students. He also focused on the cultivation of dignity and the ability to perceive truths. Harvard has since then became an important cultural hub in the Eastern US, and its international reputation has only grown. Harvard is an urban, private research institution. It is governed by a President, a Board of Overseers, and the Fellows of Harvard College. Harvard University carries out its administration and instruction through 9 faculties. These are the Faculty of Arts and Sciences (including Harvard College, the School of Engineering and Applied Sciences, the Graduate School of Arts and Sciences, as well as Division of Continuing Education), the Faculty of Business, the Faculty of Design, the Faculty of Divinity, the Faculty of Education, the Faculty of Government, the Faculty of Law, the Faculty of Public Health, and the Faculty of Medicine. The school also has five campuses, all of which are to be found in the Boston area. Harvard University also owns 7 libraries and 5 museums. Much of the libraries' collections and the museums' exhibitions are open for students and the public alike. Harvard University has been ranked one of the best universities internationally for generations. It has been ranked as the best university by the Academic Ranking of World Universities (ARWU), Times Higher Education Rankings, QS World University Rankings, and the US News and World Report alike. Harvard Business School, Harvard Law School, the School of Social Sciences, and the School General Sciences offers its best known and most popular majors. Harvard University is highly selective, and its acceptance rate stands at around a mere 6%. Harvard has international students hailing from 151 different countries. Harvard has been called home by many excellent, achieved, and famous alumni in a variety of fields. Eight US Presidents have attended Harvard, including President John Adams, John Quincy Adams, Rutherford B. Hayes, Theodore Roosevelt, Franklin D. Roosevelt, John F. Kennedy, George W. Bush, and Barack Obama. Many of them have said that their time at Harvard motivated them to learn, to be curious, and to stay motivated. Many Supreme Judges and Civil Rights leaders were also educated at Harvard. Other famous alumni include UN Secretary-General Ban Ki-moon, computer visionary Bill Gates, social media entrepreneur Mark Zuckerberg, and actress Natalie Portman.